Gin & Raisins for Arthritis Pain! Hubby suffers from all sorts of pain -- back, knees, thumb, and now both shoulders. He has tried all sorts of remedies from prescription drugs to booze. Plain old Aleve has worked better than anything else, but lately his shoulder pain has become so severe he can't raise his arms over his head. While grocery shopping, someone told him about gin-soaked raisins for arthritis pain (doctors had told Hubby his shoulder pain is arthritis but that was just a guess when X-Rays didn't show anything else). He bought the gin and the regular old raisins (not the golden ones) and brought them home to try. He had no instructions so he just filled a small jar with the raisins, poured the gin over them, and left them on the counter for a couple of hours. Nothing happened so he put the jar in the microwave for 1 minute then let the concoction soak some more. He repeated this process again a couple of hours later. Finally the raisins were nicely plumped so he ate a couple of spoonfuls and also drank a spoonful of the "juice" just for grins. He thought the stuff was "interesting" then forgot all about it. By then we were finished with our day and ready to hit our comfy chairs for a quiet evening of TV. Hubby sat down complaining about his shoulder pain and wondering out loud about how he could cope with everything he has to do right now (we're selling our house and moving back to CA to be near our kids). His mood was bleak. About 45 minutes later, I noticed that he kept interrupting the TV shows with a running commentary (something he only does when he's feeling good -- he's a trivia expert on the entertainment industry). I'm not usually all that sensitive to his moods, but this was the most dramatic mood-swing I had ever seen in this man and I've been married to him for 48 years. That's when I put it all together and realized it had to be the raisins. Since he had forgotten all about eating them, this was definitely not a placebo effect. It was the most amazing thing I've ever seen. Not only was his pain diminished by about 80% but he was also energized and animated -- not dull and dopey like you get with heavy drugs or too much liquor. The only downside to these magic raisins was that he felt so good he couldn't get to sleep so he wandered the halls till the wee hours of the morning. Note: He had been taking a shot of straight gin occasionally for the pain anyway and it never did anything but dull his senses. (The way he put it, with the gin alone he still hurt -- he just didn't care any more.) This means his reaction was definitely due to the combination of the gin and the raisins. The next morning, I did a Google search for gin-soaked raisins. Every post said you must use white raisins -- we didn't do that. They also said to soak them for 2 weeks -- we didn't do that, either. Finally, they said to only eat 9 of them. OOPS! Hubby probably ate 35. After my research, Hubby tried the 9 raisin approach, but it didn't help so he added a few more, but he's a big man, so he always needs large doses of medications. Sadly, the effects only last a couple of hours, so this treatment can't be used for total pain management, but it can give almost miraculous temporary relief. eHow has this recipe for gin & raisins. Here's what The Peoples Pharmacy has to say about gin-soaked raisins. 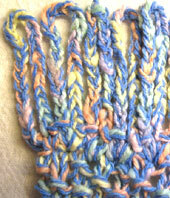 Easy, continuous loop fringe to crochet, using only chain stitch and slip stitch. Instructions.